Generally, the classics Naxos AudioBooks has specialised in over the past 20 years require a relatively mature reader. Not always of course, but in the main this is true: it wouldn’t seem right for War and Peace or even Sherlock Holmes to be read by someone in their 20s or 30s similarly Homer or Dante, or Trollope. But sometimes a younger voice brings a special quality of urgency, and a sympathy with young protagonists that trumps the expectation of an authoritative narrative voice. This month we release Under the Greenwood Tree, Thomas Hardy’s second novel. It is a wonderfully engaging tale of 19th-century village life at Christmas, centring on the instrumentalists and singers who provided the music for Mellstock parish church. For generations, it was common throughout England that villagers who played instruments would provide the music for the parish church. This continued until the latter part of the 19th century, when organs were installed and a more ‘professional’ organist displaced the rustic musicians. Hardy himself knew all about this as he used to play the violin in his parish church. Hardy was just 32 when he wrote Under the Greenwood Tree, and it is read for us by the gifted actor Jamie Parker, who is of a similar age. He recorded Far From the Madding Crowd (published by Hardy two years later) for Naxos AudioBooks earlier this year; it proved him to be a natural reader of classics, comfortable both as the narrative voice and as the many ‘Wessex’ characters that populate the novel. Under the Greenwood Tree presented a particular challenge for Jamie because after a short introduction there is a gathering of musicians preparing for a rehearsal. He manages these different characters, their varying natures and ages, with ease, and shows how much can be gained from the audiobook medium when in skilful hands. Most listeners will get a far more precise picture of the characters and how they sound than they would by translating the words from the page to their inner ear through reading. Jamie Parker has a natural ability when it comes to accents and personalities. Shortly after recording Under the Greenwood Tree, he started rehearsal on that most delightful of musicals, Frank Loesser’s Guys and Dolls, at Chichester Festival Theatre in the starring role of Sky Masterson. It is difficult to imagine a work further away from the milieu of Hardy than the Damon Runyon stories that Guys and Dolls is based on! And he has just won the UK Theatre Award for the best performance in a musical. 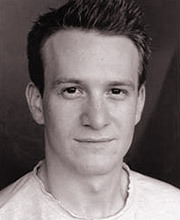 Jamie, one of the original History Boys (he toured the world with the first production), enjoyed every moment of the show – and every performance – as it gave him the opportunity to put his musical gifts (he is an accomplished pianist and singer) on show. But as soon as he finished the run, he was back in the Naxos AudioBooks studio recording two more key English classics for next year – under wraps at the moment, I’m afraid. His star is clearly in the ascendant – he played Henry V at the Globe Theatre after a UK tour, he was in the BBC production of Parade’s End, as well as other musicals, and he rarely has a moment away from stage or microphone. ‘It was a real pleasure to discover Thomas Hardy from a reader’s point of view. He has so many characters, all of which are endowed with a vivid, sometimes even cartoonish individuality. The novels are beautifully, intricately constructed. I felt I needed to achieve an informality in the delivery, which is only possible through familiarity. ‘I still think about Far From the Madding Crowd months after having recorded it. I remain perpetually torn between Bathsheba, Oak, Troy and Boldwood in even the most minor everyday actions, constantly asking whose school of thought or actions I’m falling under or succumbing to. It is a sincerely humane and eternally moving book. I will never forget the scene by the church doors, hearing Lead Kindly Light coming from the choir. If people enjoy discovering that work through the audiobook half as much as I enjoyed recording it, I’m hopeful for it. I feel it should stand. ‘I love the primacy of just telling a story. I try to be my own audience, wondering if the ten year old me would still be listening, and if not, why not. It feels fundamental, somehow nakedly either authentic or merely articulate. Neville Jason described going into the studio for the Proust like going into a monk’s cell, and I get that, although on a much briefer scale. It is a kind of retreat, in which one hopes for revelation, through a childlike openness. After the best sessions there’s a purged feeling, a renewal, and a connection to something larger, which is unique to something as solitary as reading aloud to a microphone. It’s strange to find oneself equally grateful for the absence of an audience and bereft of the imaginative energy listeners would bring were they present in the room.